This is not marked Kreiss but I believe it may be one of their elegant heirs figures. 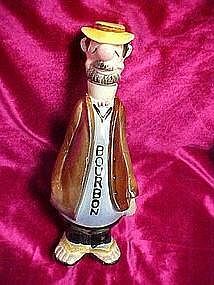 This one is a bourbon decanter. He is a hobo that is trying his best to look distinguished! Made of hand painted glazed ceramic. Very good condition. There are the two tiniest fleabites on the edges, that are almost non existant. He measures 11" tall. If he is Kreiss... this is a real deal for the collector!